EyeTV software version 3.6.3 and above can use two of the EyeTV Netstream 4Sat tuners by default. The other two are reserved for mobile use. However, you can try a special command in the Terminal, which is a currently experimental (unsupported) way to use four tuners all at once on your Mac. This assumes that you have the appropriate LNB that has the capacity to receive 4 channels at once. Using 4 tuners at once will significantly increase the amount of network bandwidth in use, and will require more processing power. Performance may be hindered depending on your computer and network speed. You may not be able to receive 4 simultaneous HD channels via typical wireless networks. Since this is an experimental and unsupported feature, we welcome feedback, but cannot yet guarantee that the experience will be 100% stable. DiSEqC has to be configured correctly in the EyeTV Netstream app settings. One Unicable output is connected to port 1 of EyeTV Netstream 4Sat -> 1 – 4 channels depending on the number of available User Bands. The User Bands have to be configured correctly in the EyeTV Netstreamapp settings. Hi, just tried to activate the 4 tuners but your advice is not working: "defaults[75989:13492319] Unexpected argument tuners”; leaving defaults unchanged." ~ $ defaults read com.elgato.eyetv | grep "SAT"
There doesn't appear to be a item "SAT2IP"
2017-01-22 16:13:40.541 defaults[65494:27411099] Unexpected argument tuners”; leaving defaults unchanged. 2017-01-22 16:13:52.830 defaults[65504:27411224] Unexpected argument -int; leaving defaults unchanged. I also have an EyeTV Diversity connected and can recored simultaneous programs on it while simultaneously recording 2 on Netstream 4SAT and record 2 more Netstream 4SAT programs on another computer. Did anyone else (from GT) read the thread? Please explain what the "format issue" is and how it can be changed? I raised an incident regarding this with Geniatech Support and finally had a response after 3 weeks. It suggested that I do what we have been doing above and my response was to send them a link to this discussion. I't might be another 3 weeks before they respond but we'll see. I omce was so dumb to buy the Netstream 4C. It had the same problem. For almost a full month Ihave been emailing with their technical people. So I returned the unit to the reseller because it did not work as expected. Also because in their information there is no limitations mentioned. elsewhere in this forum this issue is discussed and there a member of GT said the limitations is built in because in their opinion no one will want to encore/watch more than 2 station. Dumb idea! 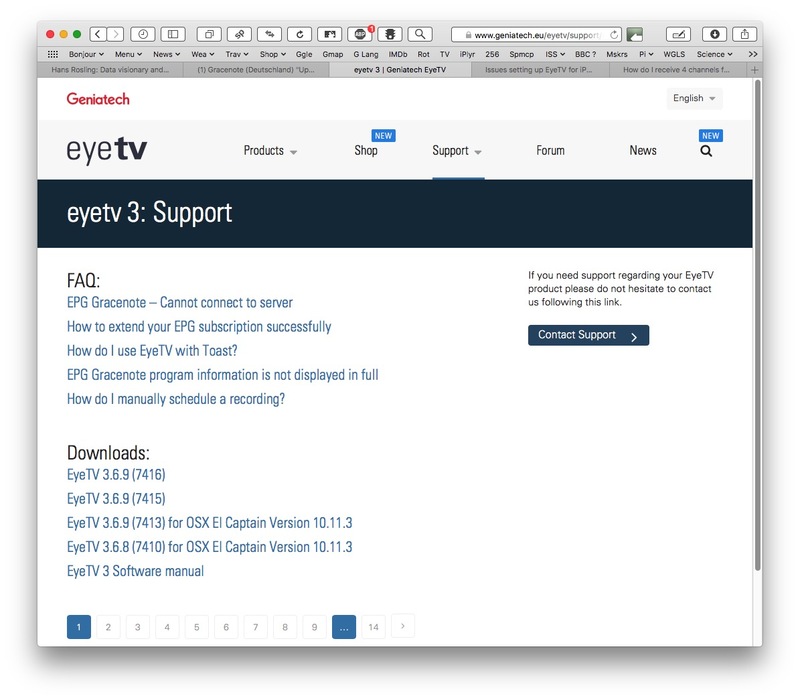 Question: How do I receive 4 Channels from eyetv Netstream 4sat on my Mac. EyeTV software version 3.6.9 and above, as a standard can use two (2) of the EyeTV Netstream 4Sat tuners by default. The other two are reserved for mobile use. Hi Mikyesun, I was trying this with 3.6.3 (7516) which I installed because of EyeConnect not working and leading me to install 7516 which didn't sort the EyeConnect anyway. Geniatech's website is a bit confusing in that it lists builds 7515 & 7516 which one would believe are later than 7514. That said I do now have this working with build 7514. Not only can I record 4 channels from Netstream 4SAT I can also record 2 more channels from my EyeTV Diversity. This may sound a bit of overkill but the EyeTV Diversity is useful in that it allows the use of the EyeTV remote control for both 4SAT & Diversity which is very handy. I now have to sort out the EyeConnect problem but that's for a different topic although I do have a support ticket open for it. Connection speed to NS 4SAT is not a problem as my iMac is connected by cable to router. Recording 6 channels may prove to be too much of a load on computer itself but that's my problem. 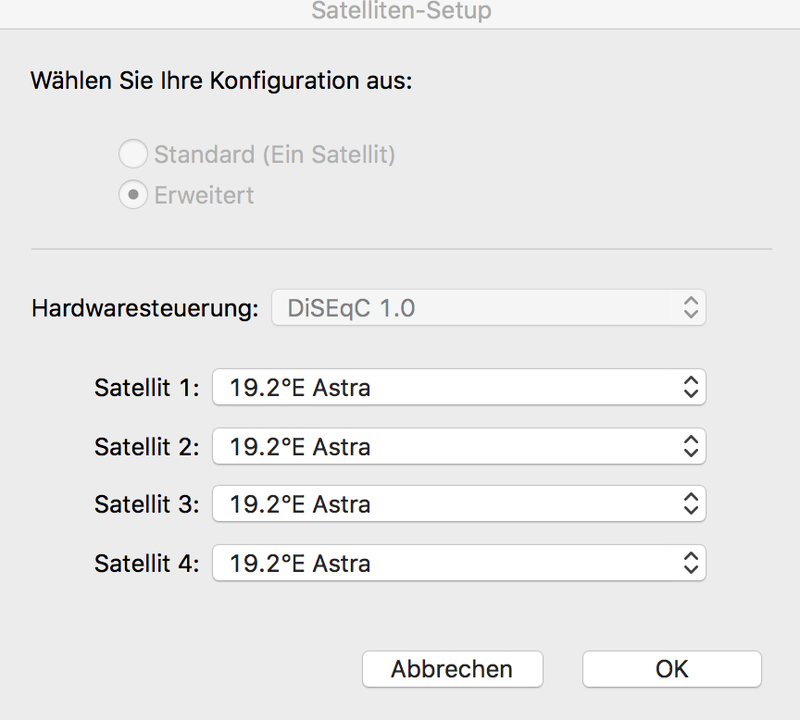 we have tested successfully based on MacOS Sierra and eyetv 3 version 3.6.9 (7514) also the eyetv netstream 4c (cable), we can record 4 channel or record 2 and watch 2 channels. If you wanna try, please follow the instruction above, and again you can try that special command in the Terminal, which is a currently experimental (unsupported) way to use four tuners all at once on your Mac. As far as I know the usual practice is the higher the build number (7516 in this case) for the same version number, the more recent the version is with the highest build number being the latest. Am I wrong? I am assuming that 7514, 7515 & 7516 are build numbers. This is how I was lead to install build 7516. When selecting "Share my EyeTV archive" the EyeConnect Update Required dialog box opened, when clicking on it, it opened https://www.geniatech.eu/eyetv/support/eyetv-3-en/. Now I'm not sure which version of EyeTV I was running but having found that uninstalling EyeTV doesn't uninstall EyeConnect and leaves other preference files laying about. All seems to be in order now. That is EyeTV 3.6.9(7416), not 7516. So the latest version of EyeTV 3 is 3.6.9(7514) now. 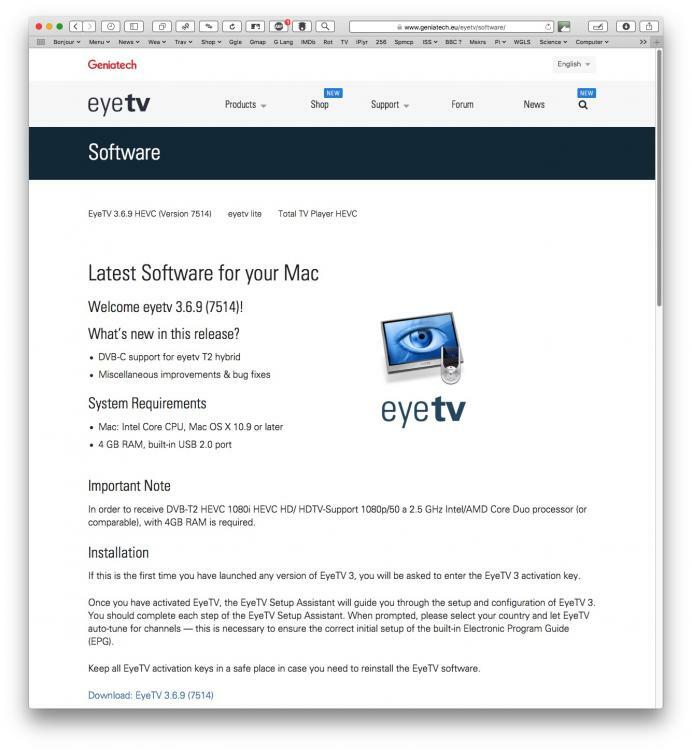 EyeTV 3.6.9(7514) has EyeConnect 1.7.3(623) which is also the latest version of EyeConnect. Must be double vision on my part. Hi guys, may I switch back the discussion to the releasing of 4 Tuners in EyeTV? I have used the new syntax and in fact, Terminal responds with acceptance. Great. But still only 2 Tuners appear at EyeTV, although I have activated all four with the Jetstream app on the iPad.?! @mikyesun: Can you confirm that also 4 unviable tuners are released to EyeTV? I have to admit I don’t understand why 7415 & 7416 are available for download as they seem to have been replaced by 7514. And I think it would be better if all downloads were on the same page with notations as to why they are available. I found using 2 different pages confusing and got completely muddled up by the similarity of the numbers, 7x14, 7x15, 7x16. Hope this exercise has been useful to others. yes - I can confirm, you are on unicable, or on qad / lnb? Unicable is installed. 12100, 1420, 1680 and 1040 MHz each one tuner. But satellite setup offers only 2 tuners?! 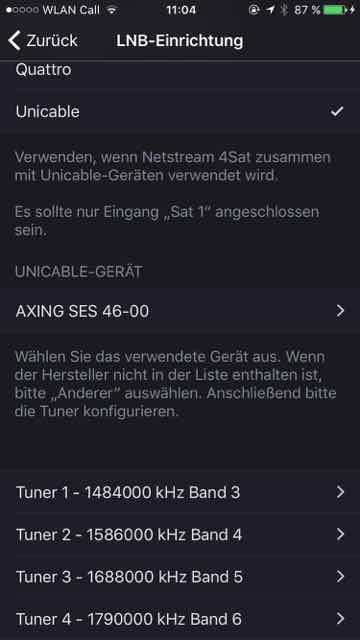 thanks for notice - hm - we will check with Unicable /4sat today - this so far we have not tested - only settings for 4sat/Quad LNB and 4c and again we are in a early experimental stage, we come back on this. 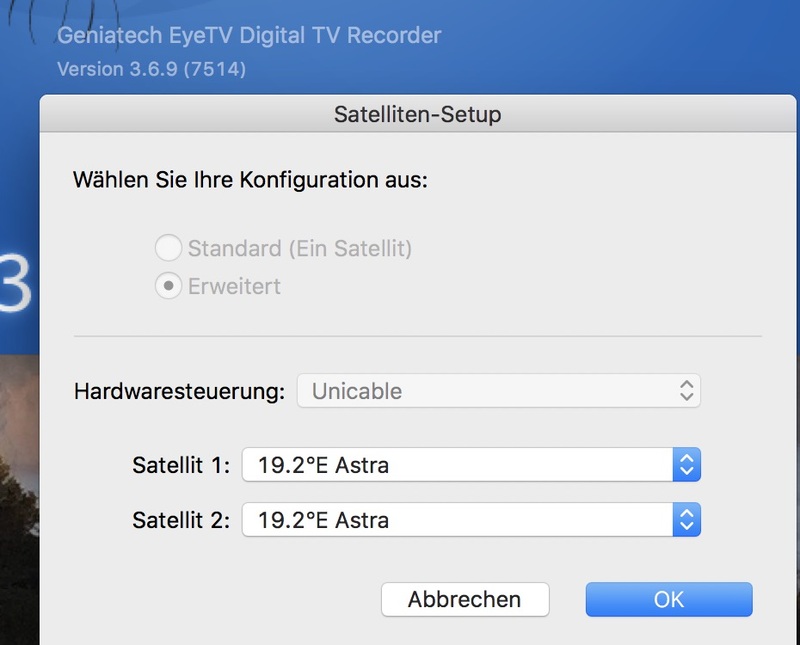 tried, I verified your results, based on macOS 10.12.3 (16D32) with eyetv 3 version 3.6.9 (7514) and with Unicable settings below, 4 Tuners cannot be access, will check with R&D and come back, please stay tuned.